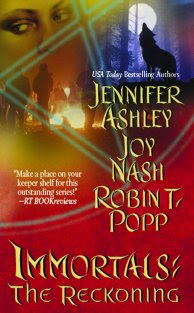 Immortals: The Reckoning is out!! I saw it at Target this morning. Also over at the Chatelaines blog, I'm doing a giveaway of Book 5 (The Redeeming) or backlist of your choice if you've already read it. Part 2: I'm trying to generate friends at Good Reads, so if you want to friend me, I'm there as Allyson James. I'm not sure how the friend requests work, but if you can figure it out I'm glad to have you . . .